Sarah was recorded in the newspapers as either thirteen or fifteen when she was arrested in company with Sarah BLAKE, Mary Ann O’HARE, and Amelia and Sarah Jane JOHNSTON. She had probably already been in employment as a servant as she had appeared in September 1869 she took another servant, Susan RILEY, to court due to an assault that had occurred in the Belmore Market.32 This charge was dismissed. Sarah and the four other girls arrested in October 1869 appeared in the Sydney court on 8 October.33 Constable THOMPSON deposed that, between seven and eight o'clock the night before, he had found the girls in York Street, and one of them complained to him that they had left their homes on Sunday night and had been sleeping out and leading bad lives. Monday and Tuesday nights they passed in a house in Hay-street. On Wednesday night they went to Ivory's stables in Bourke-street, Surry Hills, where they were going to sleep with a jockey but were turned out by the police, and promised to go home ; they however then went and passed the rest of the night in an empty kitchen in Kelly's-lane. Sarah’s mother was in court but was unnamed and stated that she had no control over her. The girls were ordered to be sent to the Industrial School at Newcastle and the bench stated that they were of the opinion that 'the whole of the blame of the present position of these children rested on the parents. '34 Sarah's record would have been recorded in the now missing section of the Entrance Book so no family, religious or educational details can be verified from this source. … conduct has been so very indifferent and her inability to do her work properly so inconvenient to us that I am most anxious now that she should leave my employ. For some time past she has been so impertinent and shown such disobedience of orders, neglect of her ordinary work that I fear it my duty no longer to submit to it. Besides this for some weeks she was confined in the Maitland Hospital with a bad toe and now the same thing is likely to occur again as you will see by the enclosed certificate. … The girl herself is tired of the place and wanted me to let her go without communicating with you. All I want is that the indentures may be cancelled so that I may be freed[?] for the girl without going before the bench to prove what perhaps I cannot prove. It is expedient it appears that the girl whatever her age between 16 and 18 should be allowed to marry John Reid who is a young man fairly spoken of and in present employ. I have to inform you that on going to the Registrar of the Morpeth district to procure the papers for Mr Middleton's consent, I ascertained that she had been already married to John Reid on May 24 last by the Primitive Methodist Minister Mr Jabez Ashmead who lives within a few doors of my house ; and that she stated herself to be of full age. I at once communicated this matter to Mr D. E. Middleton and on my return home questioned the girl about it. She acknowledged to being married so I at once sent her away to live with her husband. I may add that some time ago a report of her being married reached me and when mentioned to the girl was [? ]ed to be true. You will have the goodness to report this to the Hon. the Colonial Secretary, and I hope that for the sake of justice he will direct such a breach of the marriage law shall be punished. LUCAS passed COLES's letter on to the Crown Solicitor who responded that ASHMEAD should be prosecuted if it could be proved that he had known or had suspected by Sarah's juvenile appearance that she was underage.41 No indication has been found that any prosecution of ASHMEAD occurred. Sarah GRAHAM was a twenty-nine-year-old from County Cumberland when she arrived in NSW aboard the St Helena. The second immigration reel confirmed her maiden name and recorded that her parents were John and Mary GRAHAM. Her religion probably differed from that of her husband and was probably52 Church of England.53 After James's death, Sarah began a relationship with George Henry ANSELL or ANCEL.54 The couple never married. George ANSELL senior died in 186455 and Sarah very soon remarried William J. ROGERS at Windsor. It is unknown why during September 1865, in Sydney and after the date of this marriage, that Sarah was admitted to Darlinghurst Gaol charged with vagrancy56 and it may be that William ROGERS had abandoned her. Gaol records recorded that she was the forty-three-year-old Protestant, Sarah ROGERS alias McDUFF. Her ship of arrival and her religion were confirmed in this gaol record but no description was recorded.57 Sarah was still in Sydney in 1866.58 Her death hasn’t been verified but she wasn't the Sarah A. ROGERS whose death was registered in Windsor in 1898 as this woman was ninety years old. Note: Another man named James McDUFF and his wife, Janet, were also living in Maitland at the time of Sarah's birth. 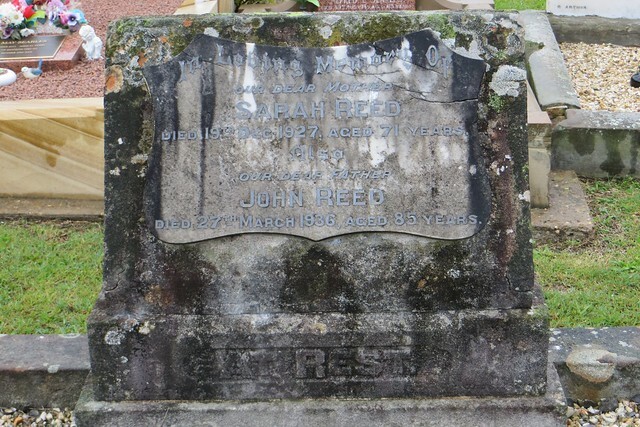 This couple probably attended the Presbyterian Church as this was where their children were baptised and are not known to be connected to the other James McDUFF. 37. It is unknown where this reference was recorded as very few dates of birth have been noted in the Entrance Book. 39. Because Sarah's indenture was for two years, it would appear that CHILD was correct and an error had been made. 40. Sarah's name would have appeared in a register in Morpeth and had CHILD known he could have proved Sarah's age. 52. The writing is indistinct.